The former 10th round pick of San Diego Padres out the 2015 MLB June Amateur Draft has signed a minor league contract with Boston Red Sox. 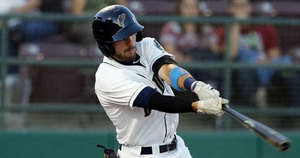 Justin Pacchioli just leveraged an All-Star season with the Somerset Patriots in the Independent Atlantic League to a shot to move up the rungs of the Boston Red Sox. After taking a year off to care for his ailing mother, Pacchioli had himself an All-Star year. He hit .281 with a team a team high 61 runs, third in the league with 35 stolen bases (caught two times), and tied for sixth in OBP (.384). All these stats are very reminiscent to his numbers at Lehigh where he compiled 69 stolen bases in four years (caught three times) to go with a .344 batting average and .449 OBP. No matter how good anyone thinks they are, you never really know who’s watching. When the word came down that the Red Sox were interested, it was still very surprising despite all that he’d accomplished. After four games with the Salem Red Sox he’s still waiting to record his first hit, but that comes with the territory. With nothing but great comments about his ability and character, Salem has themselves a competitive guy with a knack for causing chaos when he gets on base.